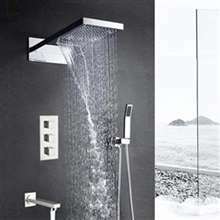 One of FontanaShowers most amazing shower systems! This generously proportioned recessed ceiling showerhead provides overhead options for mist, rainfall, cascade, and a muscle relaxing steady pour of water down the middle. The system includes four adjustable massage jets and a handheld shower for all over coverage. 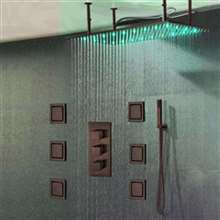 And if you thought the Reno Brass Multi-Function Shower System couldn't be any better, it also happens to be LED! I have yet to actually install it, as this is part of a basement remodel. 1) Mixer supports 5 functions, not 6, which they told me once I had placed the order and asked if I still wanted it. That mixer only allows 2 functions to be used at the same time. 2) Directions. No where on the unit could I find if it was threaded for NPT (US Standard) or BSPP (British/rest of world). After googling the product number (DF5422), it definitely appears to be BSPP. I ordered some adapters off amazon about $50, so everything will be NPT, and my plumber will be happy. 3) Shower jets. The manual was hard to read (light print). In the end I ended up purchasing some Delta shower jets, that had clear and concise direction. The included shower jets did not mention the threading and connection type. 4) From initial order time to when all the parts showed up from a month. Luckily I ordered with plenty of time before my plumber needed it. I first thought that this thing was rather expensive, and yeah, I did think of buying the other shower set I saw before this. But then I thought that if this shower set is really as good as it claims to be, then maybe it's worth it. So I got it anyway and so far I'm really happy with that decision. Now, I think the price is reasonable. I was kind of hesitant to buy this shower set at first because it seemed rather expensive. However, after talking it through with my husband, we decided to give this one a try. If it was selling for that high, then it must be a really good shower set. Well, we soon found out that it was. Its performance was well beyond our expectations. I think it may have even surpassed them. For the price I paid for this, even at the sale price, I have to say that I am not very impressed. It's good, yeah, but it's not as great as I hoped it would be. For one, the LED lights aren't very bright at all. I can hardly see them when I shower in the morning. Maybe that's because the bathroom's bright because of the windows, but still, I thought they'd be bright enough to be seen even then. After reading through the product details, I finally decided to get one of these for the master en suite, and though it was a bit more expensive than what I originally intend to spend, I can say that every dollar I paid for this is more than worth it. 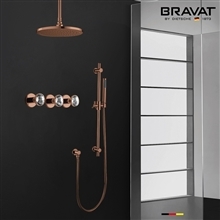 The build and quality of this shower set looks excellent, and every component works exceptionally well. This is something certainly worth recommending.